We at Grand Canyon Airlines understand the responsibility affixed to our title as the world's premiere aerial tour operators. The safety of our passengers is of more importance to us than any other company objective. Our pilots, crew, and employees go to great lengths to ensure that all equipment is up to standard and that all safety precautions are observed. It is the tireless work from each and every member of our team that allows us to continue providing the most safe and carefree travel experience for our cherished guests. Grand Canyon Airlines recognizes that our customers choose us not only for our superior tours but also for our impeccable safety record. 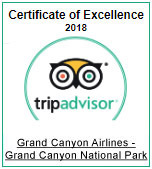 We encourage our prospective guests to research for themselves which air tour company should receive both their hard-earned money and the honor of showing them the magnificence of the Grand Canyon. The Federal Aviation Administration (FAA) requires advanced certification and licensing for any airline to operate a passenger aircraft. To receive this licensing, an airline must earn multiple certifications that cover a variety of regulations and policies. For fixed-wing flights and aerial tour operations, Grand Canyon Airlines holds a "Part 135" certificate. These government operational and safety rules apply to charter flights carrying up to 30 passengers.